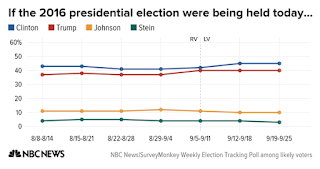 The very latest NBC News|SurveyMonkey Weekly Election Tracking Poll shows Hillary Clinton leading Donald Trump by 5 points in a 4-way election: Clinton, Trump, Johnson and Stein. In a two-way bid, just Trump and Clinton, Clinton leads by 7 points. All the talking-head experts appearing on various cable and network news shows today concede that Clinton is the more polished debater. 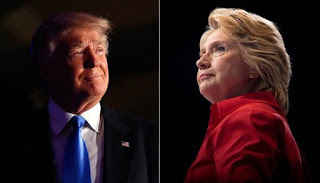 Yet, everyone is holding their breath as to who comes out the winner in tonight's presidential debate since Trump is such an unknown in a one-to-one debate. That's fair enough but what isn't fair are some of the comments about Clinton that have been bandied about by these same so-called experts who seem to be holding Clinton to another standard. Not because she is Hillary Clinton, but a woman. 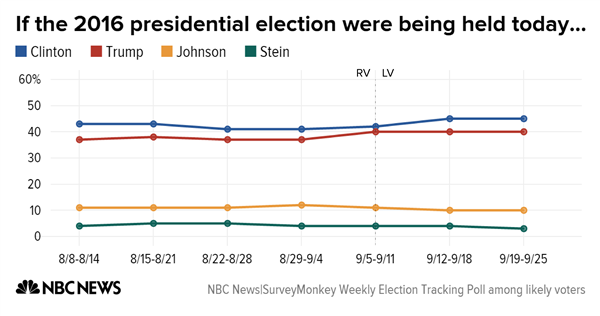 For example, one analyst appearing on CNBC said that Clinton needs to "look well" in tonight's debate. In other words, and I'm paraphrasing, she can't look sick. She can't cough! Yet, the same analyst doesn't say the same about Donald Trump. True, Clinton did have a bout of pneumonia and had to rest but, from all of her recent appearances, bedrest has done her a world of good and she appears back in form. In any other debate, between male opponents, such a comment would either be a non-issue or not even made. Everyone gets sick and if they do what their doctor says, they get well. Apparently, women do not. To suggest that an occasional cough during tonight's 90-minute debate would be a sign of Clinton having a health relapse is not just absurd but insulting. It's as insulting as Former Sec. of State (SOS) Colin Powell describing Clinton in a leaked email as having "unbridled ambition." I would think that former SOS Powell suffered from that same 'personality defect' to get where he eventually found himself — from the combat zone to the White House. Unfortunately, it's not just the talking-head experts and political influencers who are guilty of disparaging Hillary Clinton. It's women on both sides of the political aisle. Women can be other women's worst enemies. It's one thing to not agree with Hillary Clinton but it's quite another to so intensely dislike her because her critics and her opponent choose to attack the core of her being, rather than her politics. And that line of attack speaks volumes about her opponent, but nobody cares. Why? Because it's considered normal for a man to build his reputation and fortune on being aggressive, striking hard bargains and being "bitchy" to achieve his goals. But not for a woman — yet!